"Ranked among the luxurious and royal hotels in India, Bundelkhand Riverside heritage hotel is a perfect combination of old regal charm and modern comforts. Facilitated with all basic amenities, the royal hotel boasts of 26 luxury bedrooms. Bundelkhand Riverside, the royal retreat of Maharaja of Orchha is regarded as one of the finest buildings, depicting the cultural heritage of India. The building is ornamented with ceramic tiles (used in medieval period). With comfortable housing spaces, the resort owns four terrace-Mughal gardens; mainly used for wedding or other grand occasions. 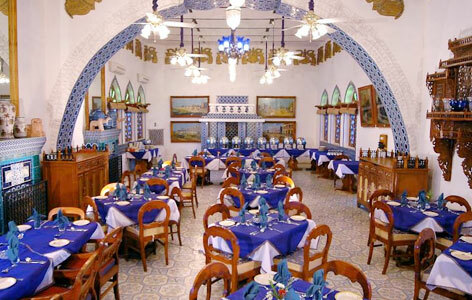 You can also walk around some 400 years old monuments and the relics, within the heritage hotel. Owned by grandson of Orchha’s last ruler, Vir Singh, Bundelkhand Riverside acquires an area up to 50 acres on the banks of River Betwa in Orchha. The Bundelas trace their descent from the Gaharwar Rajputs of Benaras. Specifically, (dating back to 1895) the old house was used as hunting lodge by the erstwhile royal family of Orchha. 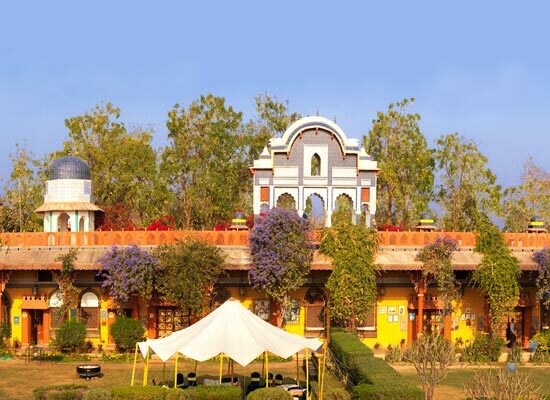 The present resort is now one of the most popular heritage hotels of Madhya Pradesh. Being a premier heritage hotel of Orccha, Bundelkhand Riverside offers you all the comforts and ease that you crave for. In order to make your stay comfortable the resort provides you with all the modern facilities. 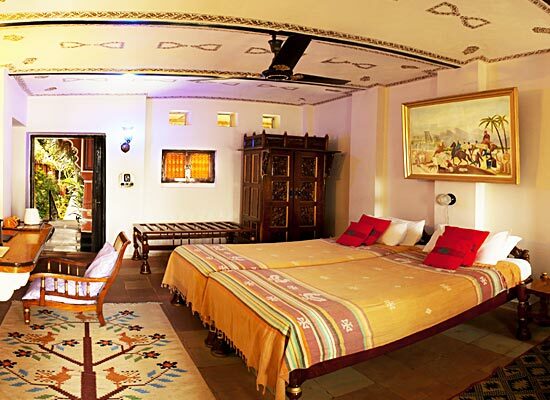 Serving you the finest luxuries, the resort features antique furniture of Indian and British style. Moreover, the interior design of Bundelkhand Riverside presents a palette of great colors depicting the glory of the erstwhile Bundela rulers at Orchha. Total there are 26 luxury bedrooms, out of which 17 are facing the pristine Betwa River and have private verandahs; from where one can adore the pleasing scenery. Riverside resort appears more captivating during full moon nights. All the rooms are fully- maintained as per modern traditions with warm fire-places in each room. The guest rooms are quite large, with attached washrooms. Washrooms too are greatly designed with bidets and showers along with toiletries. Each room is handicapped friendly. Like the luxury rooms, Bundelkhand Riverside heritage hotel has also taken a good care in the dining options for its customers. 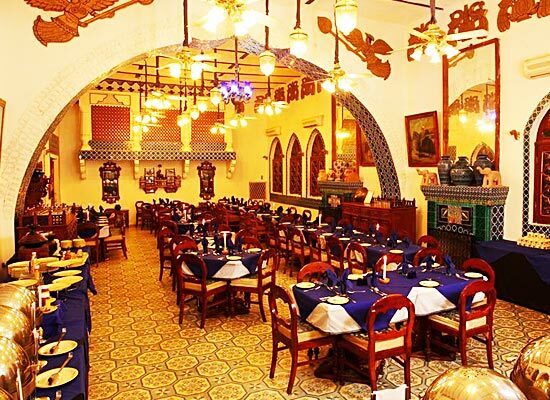 Enjoy the mouth-watering delicacies of both Indian Continental and Anglo-Indian cuisines (cuisines of Raj period). You can also dine out and enjoy the sunset beside a bonfire. Settled on the banks of River Betwa, Orchha is a great historic town. The village boasts of some fabulous architecture, dating back to 1895. It is one of those destinations in India where you can sit and adore the beauty of nature. Moreover, there are sufficient number of accommodation options in the village which will familiarize you with the culture and tradition of our country. There are various tourist attractions in and around the Bundelkhand Riverside heritage hotel. Some of them are the ancient temples including the Raja Ram Temple, Laxmi Narayan temple and Chaturbhuj temple. Other attractions include Jahangir Mahal, Raj Parveen Mahal and the Phool Bagh (formal graden).